Artiss YouTube Embed: The YouTube ID of dSUkI5Y40es is invalid. Many families affected by Osteogenesis Imperfecta believe they are alone. Treatment is hard to find and resistance is the norm, but the Crystal Children Foundation was established to fight for the rights and needs of children and families with OI. The foundation was established as such in the 2007, and now helps 57 HI cases reported in Panama, while looking over the country cases. Through the years, the foundation has helped countless families with expenses, food, treatment, transport, and, other than fight to be recognized and get the necessary drugs for OI in Panama. "We want to help all,"Says Dayana, director of the foundation. "But the reality is we have no government assistance; we have very little help. We do activities as a foundation to raise funds; received very little assistance from others. " "We started here in the city, sending information, inviting people to listen to us. The truth is that it is a rare disease, and so we are a little harder to hear us; We are a small group, and there are times it costs more to make ourselves heard. " 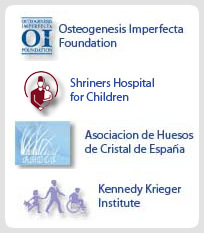 Before the creation of the foundation, get treatment for OI was almost impossible. Thanks to Children's Hospital, the foundation has helped to improve the little treatment can be given here in Panama. "We must work as a team with the foundation,"Says Dr. Jorge Mejia, one of the doctors working with the OI. "The foundation that works for both children, almost 24 hours a day, and that inspires us as doctors to do a better job when dealing with these patients. " Crystal Children Foundation will continue fighting for these children. The main priority of the foundation is to get the drug pamidronate in Panama, that will help patients to have stronger bones. Thanks to the foundation, any child with OI is alone. The foundation is always there for patients, and to take care that every child gets a chance to live and have a great quality of life. "The foundation has helped us both, by Pampers, food, and so. They help us to fight for treatment. We really need and appreciate the help of the foundation. " •Itzel Aeneid Machore, mother of a Crystal Child"I get lots of help from the foundation of how to treat my baby, because many doctors do not know much about the disease. Dr. Mejia is my daughter, and tries to explain everything he knows. " •Zuleika Godoy, mother of a glass“Créame, without foundation, doctors would be treating these children without any protocol, doing what they wanted. " •Dr Jorge Mejia"The foundation has had a major impact on my life because it taught me how we should treat people with disabilities and how to fight for their rights. They have the same rights as any of us. " •Geovanni Private, Administrative Assistant de la FUNDACION"We've all taken the challenge. The foundation was born of a woman desperate to give a better life for her daughter, and promised me to help her and all other children. Everyone has needs, and deserve a better quality of life. They have the right to be respected; are people with the same rights as us. " •Theodore 'Chachi' Rodríguez"In five years, I see the foundation as a great mother who will bring a solution to the problems of these children and their families. Dayana see in five years, really proud to have fulfilled their dreams. You will see brought to Panama to treat each patient, and even going to be able to open a clinic specializing in OI, and most importantly, is going to be able to do the surgeries here, because right now you can not do here. " •Alvin Nunez, father of a glass"I want to thank the foundation because thanks to them I could get help with treatment and that helps my family, as all other children. "